Just Simple Premium HDMI review | What Hi-Fi? 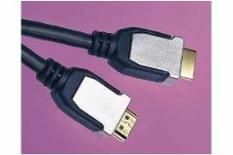 One English penny is all you need to make this HDMI your own – that, and £4.50 in postage (what's it being posted in, a gold-lined envelope?). It appears no different from the super-cheap cables – picture and sound is OK, but you'll struggle to see any improvements over the freebie you get in most boxes. You could have three of the MicroVillage cables for the same price (more or less); that has to make this poor value.